No real comment; I’m not in their dire situation. omg! i don’t know how to respond to that. sigh. I wish I could read the service or listen to it. 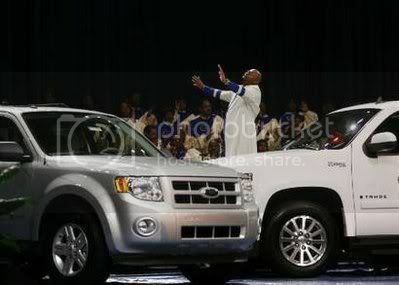 There is a large chance (minus the car’s on the altar, maybe?) that the church is responding to the fears of their congregants who work in the industry and are faced with losing everything. That’s not such a bad thing, is it? I drive and walk around in white collar suburbs and many times I’ve been “driven” to pray by SUVs. Especially if you’re driving in something smaller than the said SUVs. "You make God sound like an opportunistic virus"